One thing that I find impressive about Las Vegas is that every time I go back it seems to be a different city. The expansion and buildout is just incredible. People change too. A few years ago you would walk down the strip and bump into Mexicans handing out stripper callcards just a foot or two away from an evangelical Christian throwing profanities at people passing by in short skirts, warning about the end of time, cause thats what Jesus would have done. The crazy Jesus guy has been replaced by the Ron Paulbots, which appear more mindless, antagonizing, insane and confrontational than even the Jesus guy ever was. The stripper mexicans are still there but they are looking more appropriate than ever. But here are a few funny things. 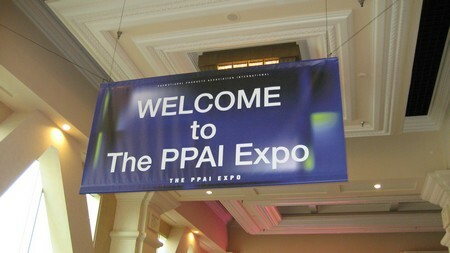 This was a convention going on at Mandalay Bay – PPAI. Promotional Products Association. This is a conference about SWAG! Huge too! 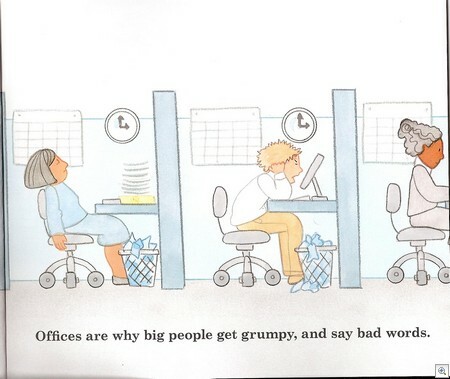 This is a little childrens book that was given away as SWAG at Microsoft’s CES podium. As someone in our group mentioned, “Better get two, cause Windows Home Server won’t be around for long”, so I did. The book is just hilarious and I had to share the scans from it. 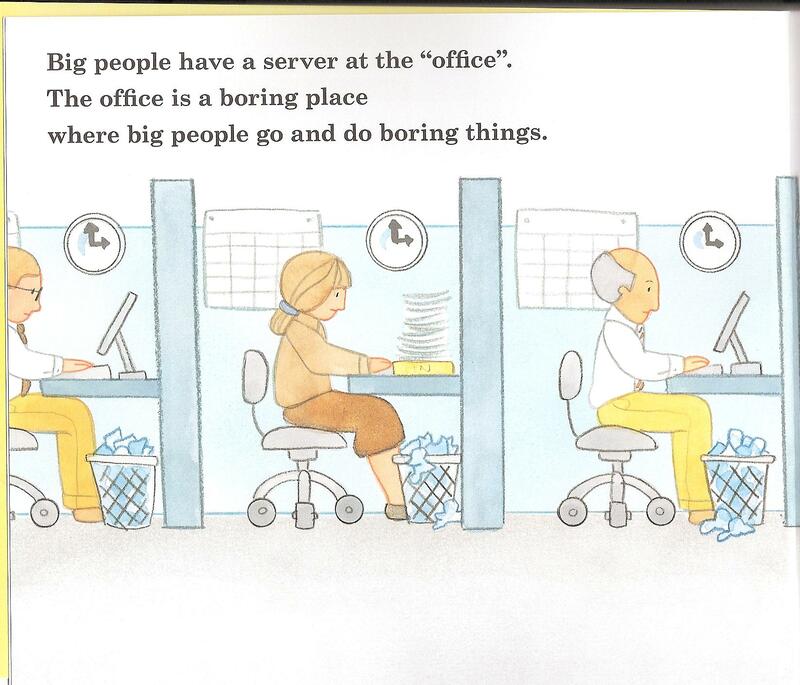 “Big people have a server at the ‘office’. 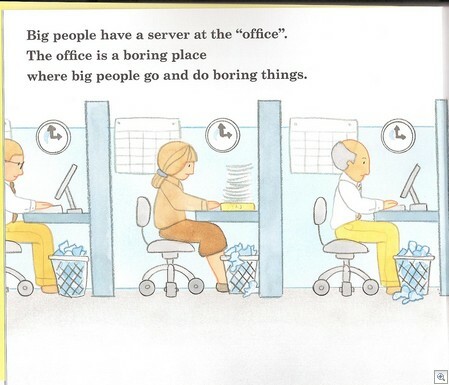 The ofice is a boring place where big people go and do boring things. Offices are why big people get grumpy, and say bad words.” – Couldn’t have put it better myself, way to go WHS! “So thats how you can learn more about the food and wine thats on your table. Err, what about just talking to the people at your table? I guess thats in Surface 2.0. Talk about a divorcemaker. Can you imagine heading to a restaurant with your wife and in the middle of her story you start checking your email and the pr0n spam pops up at the same time as the 16 year old is putting food on your table? Now you’re being sued for alimony, sexual harrassment… Maybe Surface 2.0 could have a quick LawyerFinder hotspot, so you can immediately get representation from someone familiar with MS Surface. Overall, the CES was very underwhelming. Frankly, major sections of it looked like Computer Pro shows that travel the country and sell offbrand broken/stolen second hand equipment to unsuspecting audiences at county fairs and third rate venues. CES did have better lighting tho. It also had about 200 booths selling carrying cases and stickers for your cell phone and iPod. The big crown of the event was the 150” Plasma TV. This thing was large, obscenely large, yet beautiful. The rest of the TVs… meh… They made them bigger and thinner. It was about as unpredictable as Steve Jobs wardrobe. There was only one thing that really caught my eye for the most obscene, most useless invention ever that I just have to have it. They riced out a Corvette and put Saturn logos on it – four screens, one seat. Thats right, they destroyed a likely $60,000 car and put in a bunch of electronics but yanked the passenger seat.